Many industrial processes involve highly flammable materials and are a constant potential hazard. As a result, for safety and loss prevention, flame detection devices are specified to alert or shut down the process in the event of a fire. The IRt/c, alone or in conjunction with other devices can provide a good solution. Since the IRt/c is intrinsically safe, it can be mounted in the hazardous area when used with the appropriate barrier (see Tech Note No. 10), thus making it suitable for locations not possible with other flame detection devices. The recommended model is the IRt/c.10A-K-LoE. With spectral sensitivity of 0.1 to 5m, this model will measure the short wave radiation created by a flame, while filtering out the changes in ambient target temperature. It is strongly recommended that the system be tested for the desired response and control set-up. 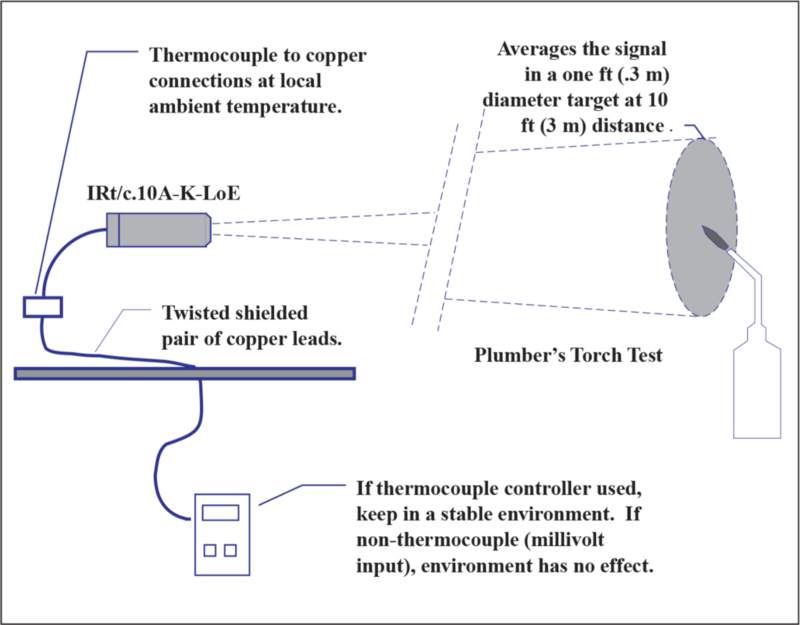 For example, the ability of the system to detect a plumber’s propane torch flame at 10 ft (3 m) can be tested, resulting in an indicated temperature rise of the order of 50°F (30°C). The monitor/controller can be set appropriately, and all flames that are larger or more luminous than the torch will alarm. Customary testing, redundancy, etc. should be observed, as required for the application.